Choose from fragrances listed and order below. Pair this with our Pikake Body Butter, for a serious aphrodisiac combo. 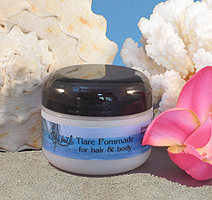 Pair this with our ile pacifique body butter, for a head to toe tropical experience. There's also our Lime Margarita Soap so you never have to be without this perky scent. Or try our fabulous Margarita Beach Spa Pedicure Collection! Baby Woozle Wash, from the Baby Woozle Collection Looking for a gentle and natural baby cleanser? Pamper your baby with this! 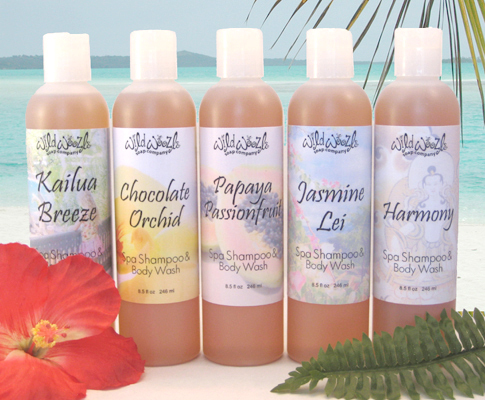 The beautiful, natural coconut scent virtually whispers "exotic tropical island" while the oil works its magic. 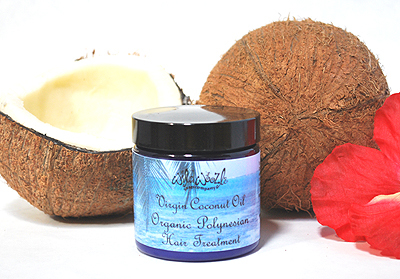 Coconut oil has been used in many cultures as a daily hair treatment for thousands of years. Studies have shown that coconut oil penetrates the hair shaft, providing essential moisture, relieving dryness and reducing protein loss. You'll see and feel glossier, silky hair with a healthy bounce. Our USDA certified organic virgin coconut oil is made from the finest, hand-selected fresh coconuts. 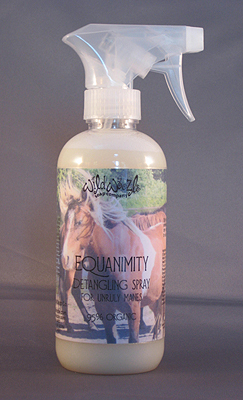 Produced carefully without chemicals or high heat, this luxurious oil has naturally high protein and antioxidant levels. While you could actually eat this decadent oil, we recommend using it as a pre-wash or conditioning hair treatment. Take your head on a vacation and see what a difference it makes! By the way, if you live somewhere where the temperature is above 76 F, this lovely oil will be liquid instead of semi-solid. Keep that in mind when you open the jar quickly! Check out the rest of our South Pacific collection! Monoi de Tahiti has finally gone to our heads. Give your thick, wavy, or curly hair shine and bounce and surround yourself with the irresistible scent of Tahitian gardenia. Does your ocean and sun-fried hair need help? Or do you just wanna give your curls some attitude? Our new hair serum is loaded with goodies to nourish your hair, add tons of shine, and enhance curls: papaya seed oil, rice bran oil, mango butter, coconut oil, tons of shine, and our sweet papaya and sassy grapefruit Surfer Chick fragrance. Beautiful! Check out the rest of our Surfer Chick collection!